Mr. Trash Wheel. Photo by Matthew Bellemare (Mr. Trash Wheel) [CC BY-SA 2.0 (http://creativecommons.org/licenses/by-sa/2.0)], via Wikimedia Commons. Perhaps because there are two eyes painted on the contraption, the waterfront trash collector in Baltimore is called “Mr. Trash Wheel.” The unique creation is solar- and hydro-powered and has been collecting trash from the Jones Falls River in Baltimore since May 2014. To date, Mr. Trash Wheel has collected over a million pounds of trash, to great local acclaim. So much so that “Professor Trash Wheel,” a second collector, was installed in December 2016 at the end of Harris Creek, and a new trash wheel is now planned for the Gwynns Falls area, which would be the third in Baltimore. The trash receptors use the river’s current for power, and solar panels when the current is not strong enough. The trash wheels extend floating booms that funnel trash from the river up to rotating forks that sort the trash and move it onto the conveyor belt. The contraption’s two water wheels power a conveyor belt that carries the trash up to a dumpster. The Trash Wheels have significantly improved the cleanliness of the Jones Fall River and Harris Creek. The creator of the Trash Wheels, John Kellett, has been looking internationally for more places to install a similar device. “Kellett, now with a construction company to build the wheels, has done site surveys in Lombok, Indonesia, Panama City, Rio de Janeiro, and stateside in Honolulu, Milwaukee, Atlanta, and Denver,” National Geographic reports. Milwaukee representatives met with Kellet to discuss a possible installation of a Trash Wheel on the Kinnickinnic River in November 2016, according to Lindsay Frost, Manager of Water Projects for the Milwaukee Harbor District. The district’s borders are generally south of the Third Ward, east of Walker’s Point and north of Bay View, encompassing 1,000 acres and 44,000 linear feet of water frontage. “Our organization has been in communication with the organization running the Trash Wheel efforts in Baltimore, and we’re exploring the possibilities further,” Frost says. As it happens, Milwaukee already has a waterfront trash collector with a cool name, the 50-foot long river skimmer called Lynyrd Skymmer — a clever play on the southern rock band, Lynyrd Skynyrd, which was the result of a 2011 naming contest. (Way to go, Milwaukee!) The Skymmer, owned by the Milwaukee Metropolitan Sewerage District (MMSD), pulls out trash from the Milwaukee, Menomonee, and Kinnickinnic Rivers. It has a captain and two crew members that work an average of 110 days a year, collecting trash and making a safer path for boats. The skimmer collects all kinds of trash, from tree limbs to barricades, and the occasional porta-potty. Each year, it collects around 70, 20-cubic yard dumpsters worth of trash and debris, but the installation of a Trash Wheel could improve efforts further. “I think anything that helps clean up garbage and helps keep the rivers free of debris that can damage kayaks and boats and everything else is a benefit,” says Bill Graffin, Public Information Manager for MMSD. “We want not only quality of life for people who live here to be improved, but we also want tourists and visitors to have a positive first impression of Milwaukee and the waterways,” he adds. But the trash wheel itself has a hefty price tag. Professor Trash Wheel, that latest one built, cost more than $550,000. Milwaukee’s river skimmer was purchased for $415,750, according to Graffin, though in current dollars that’s at least $457,000. 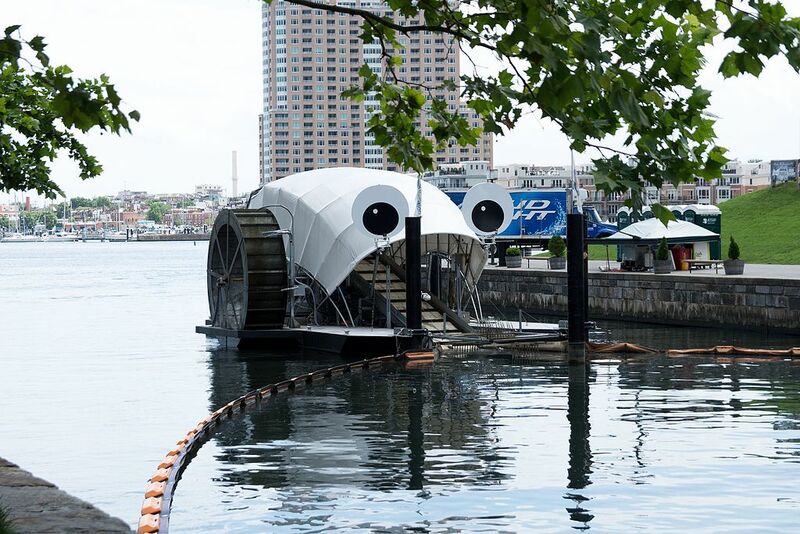 But in Baltimore they love Mr. Trash Wheel and how it has collected more than one million pounds in trash, so organizations such as the Maryland Port Administration, the National Aquarium, local businesses, and others chipped in to help pay for Professor Trash Wheel. What??? Milwaukee already has a river trash skimmer? It operates up to 110 days a year? I just rented a kayak with out-of-town friends and it was embarrassing to see the heaps of water bottles and other trash floating on the rivers. Can someone please explain why this is the case? Mr and Professor Trash Wheel operate all the time, and work really well during flash floods when heavy rains wash debris from the creeks far from the harbor. We love them and use them for photo ops quite often. Would love to see a Trash Wheel in Milwaukee! I see material float down the KK, into the Harbor, and out to the lake all the time, so it’d be great to see that stop. Yes the trash wheel operate year round and are especially effective during the biggest storms that deliver most of the trash. Baltimroe also has a small fleet of skimmer boats that literally chase down floating trash throughout the inner and outer harbor. The skimmers are very inefficient and ineffective during the biggest storms – i.e. just when trash is entering the harbor, and least dispersed. The trash wheel is quite sturdy and can routinely handle large logs and tires (on wheels) that occasionally wash through the stormsewer tunnels entering the Bay. skimmer or trashwheel, important to remember they only collect floating trash.